The study analyses migration intentions and expected length of stay in the host country, taking account of the propensity to change (or retain) migration plans during the course of the migration experience in the host country. We analyse the particular case of Romanian migrants in Italy, using a survey conducted in 2011 in the context of the TEMPO/NORFACE project. 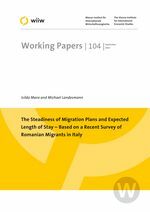 We used different specifications to analyse the exogeneity vs endogeneity of steady/changing migration plans regarding expected length of stay and migration intentions. The survey and the analysis showed that Romanian migrants, both men and women, who arrived in Italy after May 2004 have modified their migration plans, the main determinants being employment and family reasons. Migrants who have maintained similar migration plans to the ones upon arrival are mostly those with a preference for long-term and permanent migration. Gender differences in analysing migration plans matter as diverse patterns emerge for men compared to women. Differently from women, men plan their length of stay based on the employment context, especially on whether the job is adequate to the level of qualification and whether earnings match expectations. For women, on the other hand, family context variables play a significant role. The paper concludes that migration intentions could be a good predictor of migration behaviour if we account for the endogeneity of steadiness/switching of such plans.